Some people are born to be chefs, Srijith Gopinathan, the Executive Chef at the Campton Place Restaurant in San Francisco, California is definitely one of them; when he speaks about food you can feel his passion. Combined with the talents of Master Sommelier Richard Dean they make an admirable team, and provide recipes for a delectable wine pairing dinner. 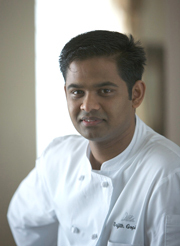 I met with Executive Chef Srijith Gopinathan before having dinner one night in late January 2009 when I was in San Francisco; where to be a successful chef today, one must be dedicated, passionate, and a culinary artist who lives and breathes food, such is the case with Chef Srijith. Growing up in Southern India he learned the art of spice blends from his grandmother, and later honed his culinary skills working in India, taking courses at the Culinary Institute of America in Hyde Park, New York, working in Europe at the 2-star Michelin restaurant, Le Manoir aux Quat' Saisons in Oxford, England, and working in the Maldives before joining Campton Place Restaurant in February 2008, where his classical French training combined with a rich spice background adds interest to the Mediterranean and California inspired cuisine at the restaurant. He has enjoyed developing his culinary skills throughout the years, and appreciates his time spent in Oxford where the restaurant had their own gardens and orchards, and used the best ingredients, as he is a firm believer that "a chef is only as good as the ingredients." In India he learned the art of spices, and that the term "spicy" has two meanings: hot, or simply a blend of spices, and has learned to add spice blends to enhance, rather than mask, his food. During his free time in the Maldives, which for a chef is rare, he enjoyed snorkeling, which he described as "like being in a jewelry store with silver and diamonds." What he enjoys about working in San Francisco, is that "California is blessed with great soil and great products," going to the Tuesday and Saturday markets where he is always looking for intriguing ingredients, and working with Master Sommelier Richard Dean, from whom he is always learning. Describing his market experience earlier that day, when he found a green radish that was so new the farmer did not even name it yet, his whole face lit up with enthusiasm as he discussed how he might use it. When not creating new recipes, he enjoys traveling and visiting restaurants to learn culinary trends around the world, and his focus is clearly on making the guest happy. When Master Sommelier Richard Dean received the distinguished recognition of Master Sommelier, he was the youngest person to receive the title, and was only the second person in the United States to receive such an honor. Today, there are 150 active Master Sommeliers worldwide and only 68 Master Sommeliers in the United States. Meeting with Richard Dean was highly educational, as he clearly knows his wines, yet he has an easy, approachable style that makes talking wines with him very enjoyable. Although he has over 20,000 wines in the Campton Place Restaurant wine cellar, which includes 15,000 different wines, when it comes to selecting a wine, his criteria is that "it has to have great flavor, and that it must be something that complements the dinner." He has worked at top restaurants around the world before joining Campton Place Restaurant in February 2008, and one of his new and highly popular programs at the restaurant are the special monthly wine dinners, “The Wine Scene with Richard Dean,” which are informative evenings of tasting and discovering wines of the world, and where guests have the opportunity to meet with guest vintners. Chef Srijith Gopinathan and Master Sommelier Richard Dean provide a delicious taste of the Campton Place Restaurant with a recipe and wine pairing for Ceviche of Diver Scallop, Ginger, Red Pepper, and Avocado Lime Gel, paired with Chardonnay Silver Mer Soleil Unoaked Monterey 2006, California. Method: Process all the vegetables accordingly and mix with olive oil, limejuice, and yuzu. Season to taste, and let rest overnight in a stainless steel bowl or food grade plastic container. Method: Place all of the vegetables in a mortar and pound, add the olive oil to the mixture, and then strain it through a very fine strainer. Check the seasonings and have it ready to serve in a pint container. Method: Purée all ingredients and pass it through a tamis (a cloth strainer, also called a tammy, or tammycloth). Store it in a squeeze bottle. Diver Scallops that are diver harvested from the Sea of Cortez in Baja, California. Method: Freeze "Count 8" type diver scallops in the freezer until firm enough to shave using a mandolin. Slice and keep chilled on parchment paper, cut into a half round. Assembly: Arrange the shaved scallops on a parchment sheet. Place the scallops on the parchment sheet on a stainless steel plate. 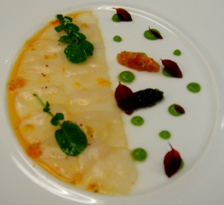 Season the Ceviche with fleur de sel and pour the seeping sauce over the shaved scallops. Let rest for 12 minutes to enhance the flavor and meld the seasonings with the scallops. Pour the excess marinade off the stainless steel plate back into the pint container, which can be reserved for another use. Slowly lift the parchment off the stainless steel plate and turn it over on a serving plate, and then carefully remove the parchment sheet. Sprinkle with a few salt crystals and brush with more seeping sauce. Have the avocado lime gel in a squeeze bottle and pipe it on to the plate, garnish with Osetra caviar, a quenelle of relish, and petite Amaranth leaves. Serve with the Chardonnay Silver Mer Soleil Unoaked Monterey 2006, California wine. Campton Place Restaurant is located in Union Square and is open for lunch and dinner daily. Read other articles on Campton Place - A Taj Hotel in the Destinations, Hotels, and Restaurants sections. Read other articles on San Francisco in the Destinations, Hotels and Resorts, Restaurants, Chefs' Recipes, Arts, Liquor Cabinet, and Wine Cellar sections. For information and upcoming events in San Francisco, please visit the Only in San Francisco website: www.OnlyinSanFrancisco.com. © February 2009. Luxury Experience. www.LuxuryExperience.com All rights reserved.